Jan Matiaska has been into turtles since 1998. He started off with Trachemys and Cyclemys genera but soon realized it was going to be the Australasian turtles that were to become his life time passion. His first Chelidae turtles were two juvenile Emydura subglobosa subglobosa specimens. Except for side-necks, the Carettochelydae is another family Jan is very keen of. Jan did not intend to become just a turtle keeper; his aim was also to look at the Chelidae and Carettochelydae matters from the scientific perspective. Being located in Slovakia (Central Europe), Jan's access to quality literature and information sources was quite limited. That is why he contacted Arthur Georges and subsequently, through Arthur, virtually hooked up with Scott Thomson. It was Scott's knowledge, experiences and patience to answer Jan's uncountable questions that helped Jan broaden his understanding of various turtle related issues. Jan got his MBA degree and currently works as a product manager in the IT industry. He hopes to gain some Zoological qualification later on in his life, when time and money allow him to do so. About a half a year ago, Jan decided to create an online information database concerning the Australasian turtles in general. He asked Scott to join him on this project. Scott, being a web site developer and a turtle lover in one person, did not refuse the offer and the partnership of a turtle keeper and a turtle scientist was founded. Jan's personal interests include herpetology, palm trees, computers and internet as a whole, web site development, traveling and ice hockey. Scott Thomson started keeping turtles in 1975. He started with Chelodina longicollis and eventually had some Emydura macquarii as well. He first bred C. longicollis in captivity in 1979. After a few years in the Army, Scott worked in the Pet Trade for a while. At this point he started doing some serious research and began his interests in anatomy. He worked on infectious diseases and other Human problems at a hospital in Sydney. He managed to get some jobs at Zoos and worked at Notre Dame Zoo in Sydney and Western Plains Zoo in Dubbo. He started a long association with TAG (Taxon Advisory Group) where he was a species coordinator for many species of Chelonian, including Galapagos Tortoises, Alligator Snappers and Greek Tortoises. Scott went to a University to gain qualifications in Zoology (Zoology Major, Mathematics Minor) and some postgraduate work as well. 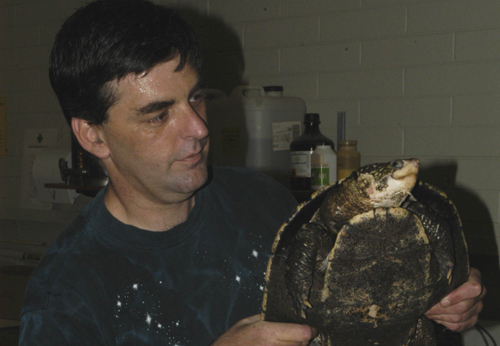 In 1993, he moved to Canberra where he worked with Arthur Georges where they set about figuring out how many species of turtle were in Australia. As recently as 1997 only 50% of the turtles in this country were formally described. It was John Cann, Arthur Georges and Scott Thomson that turned that around. Having worked with turtles from all types of angles (keeper, zookeeper, pet trader, and scientist) has made it easy for Scott to communicate with each of these groups. His own view is that the greatest failure of science in the last 20 years has been increased elitism and an inability to communicate properly with others outside science. While at the University, Scott traveled to 17 countries and examined over 10000 turtles. The database is enormous. He personally examined the types of every species of Sideneck turtle that still exists as well as many other species. From here he then went further. He felt that the key to turtle phylogeny was in their past not their present. This is a sad fact of using genetics to determine phylogeny, you cannot get genetic material from fossils so the fossil records are ignored. As such he has not only described living species (Chelodina canni and Macrochelodina burrungandjii) but two fossil species as well (Elseya nadibajagu and Reodytes devisi). Scott's personal interests include network marketing, beta testing of software, web site development, script writing, computer programming, mod making, computer games, martial arts and of course herpetology.